4 Tips to Save $25k+ on your Home MortgageEliminate The Muda! Buying a home is a dream come true for many people, but the mortgage that goes along with this experience is more like a nightmare. Unless you’re Warren Buffett’s granddaughter, you probably don’t have enough money saved up to pay cash for a home, which means you’ll have to rely on a mortgage that is paid back over the course of many years. The good news is, there are four ways you can save big on the cost of your mortgage, so you can use your money for other things (like investing in the stock market so you can become as rich as Warren Buffett). 1. Opt for a Shorter Loan. Fifteen- and 30-year mortgages are among the most common lengths you can get. If financially possible, select the shorter of the two. The reason for this is simple: the quicker you pay off your mortgage the less money you will pay in interest. Take a $300,000 mortgage, for example. A 30-year mortgage, with an interest rate of 5%, means you’ll pay approximately $279,000 in interest. Keeping the same mortgage ($300,000) and rate (5%) but opting for a 15-year mortgage will result in total interest paid of roughly $127,000. This example illustrates how much you can save by cutting back your mortgage term. Tip: Ask your mortgage broker or lender to calculate numbers, including a monthly payment, based on several types of loans. They can supply you with accurate numbers, making it easy to see how much you can save by opting for a shorter loan. 2. Make a Lump Sum Payment from Time to Time. Some people don’t have enough money every month to pay extra on their mortgage. That being said, throughout the year they receive extra money in the form of bonus checks, tax refunds, and other one-time payments. If you have the money, it makes good sense to send an extra lump sum payment to your lender. By doing this once per year it will help you shave several months or years off your term, while also saving you from paying interest. My plan is simple: I currently have a 30-year mortgage with a fixed interest rate of 5 percent. Every January, I pay an extra $1,000 in addition to my regular mortgage payment. So far, I have done this twice. By continuing to do so, I will effectively reduce the term of my loan by several years and the interest on my loan by thousands of dollars. Tip: Like many of you, I don’t come into an extra $1,000 every January. Instead, I slowly save this money throughout the year; $50 to $100 at a time. By the time January comes around, I have approximately $1,000 extra. Is it tempting to use this money for something else? Sure. But knowing that it will save me much more in the long run keeps me on track. 3. Make Payments More Frequently. As you know, your lender will send you a statement once per month. This is the amount you are required to pay. But what if you decide to pay bi-weekly instead of monthly? By doing this, you are in position to shave several years off your mortgage. For those who have a bi-weekly pay schedule this is easy to do from a financial perspective. If you want to know just how much money you can save by making bi-weekly payments, enter your information into this bi-weekly mortgage calculator. Tip: While getting on a schedule will help ensure results, you don’t have to stick with “more frequent” payments if you find that it is unaffordable. In short, it is your mortgage and as long as you pay the monthly minimum your lender will be happy. What rate of interest are you currently paying? If it’s high there’s no better time than now to refinance. By securing a lower rate you are doing two things: lowering your monthly payment; and lowering the total amount you will pay in interest over the life of your loan. The only downside of refinancing is that you will have to pay closing costs on the loan. Make sure you factor this in when deciding if this is truly something that can help you save. The earlier you refinance your mortgage the more sense it makes. If you only have a couple years left on a 30-year mortgage, for example, it is better to finish things off at the current rate. You will pay more in closing costs than you will save. Tip: You don’t have to refinance with the same lender that is holding your first loan. This is a common myth that has negatively affected many people. When refinancing, you should once again shop around for a lender with low rates, reasonable closing fees, and top notch customer service. The majority of people wait for their mortgage statement to arrive and then pay the exact amount due. While there is nothing wrong with this, there are some “tricks” you can use to shave thousands of dollars and many years off your loan. From opting for a shorter term upfront to refinancing when rates go down, make sure you are always looking for ways to save. 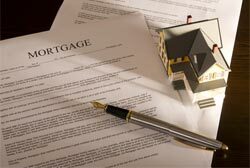 A mortgage is a huge financial commitment. By following these tips, you can benefit from significant savings on the total cost of your loan. My mortgage is my last debt, and I want it gone! I refinanced from a 30 year to a 15 year in December (3% woo-hoo!). I had put a few large lump sums down so the refi not only shortened the life of my loan, but it also LOWERED my payment. I opted to keep the payment the same as I was used to so I am paying an extra $150 / month to principal. I like that you are getting after your mortgage as well. Interesting that you save up and drop a big extra payment on it each January. My approach is to simply send every little bit of “found” money to my mortgage whenever I find it. For example, I received a gift card for $100 for Christmas – when I used it to buy things I would have bought anyway, I sent the $100 to my mortgage. Just a few days ago I received a rebate check from a cash back credit card and sent the money directly to my mortgage. Keep chipping away every chance I get! I always make a calendar date when my mortgage’s deal is over and go shopping for a better rate. It can really save thousands. I used to make lump sum payments but now at 2.29% I prefer to invest instead.